Metronomic chemotherapy is considered an anti-angiogenic therapy that involves chronic administration of low-dose chemotherapy at regular short intervals. 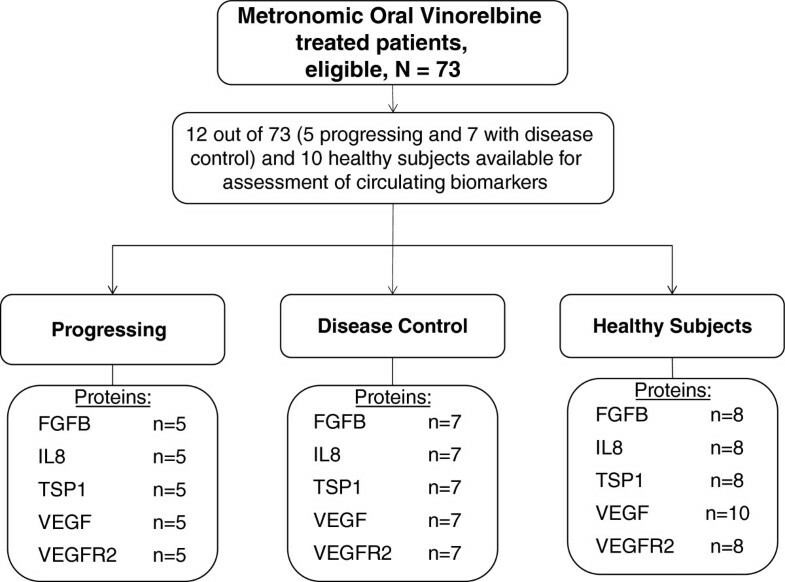 We investigated the optimal metronomic dose of oral vinorelbine when given as monotherapy in patients with metastatic cancer. Patients with recurrent metastatic breast (BC), prostate (PC) or non-small cell lung cancer (NSCLC) and adequate organ functions were randomly assigned to 30, 40 or 50 mg vinorelbine, taken orally three times a week. Treatment continued until disease progression, unacceptable toxicity, withdrawal of consent or maximum 24 months. Primary endpoint was time-to-treatment failure (TTF) and secondary were progression-free survival (PFS), toxicity, changes in blood concentrations of angiogenesis-associated biomarkers and pharmacokinetics. Seventy-three patients were enrolled. Four-month TTF rate did not differ between the three arms: 25.9% (11.1%-46.2% 95% Confidence Interval), 33.3% (15.6%-55.3%) and 18.2% (5.2%-40.3%) for the 30 mg, 40 mg and 50 mg arms (p-value = 0.56). Objective response was seen in 2 patients with NSCLC (treated at 30 and 50 mg respectively), one with BC (at 40 m g) and one with PC (at 50 mg) and lasted from 4 to 100 weeks, with maximum response duration achieved at 50 mg. Adverse events were mild and negligible and did not differ between the three arms. Blood levels of vinorelbine reached steady state from the second week of treatment and mean values for the 30, 40 and 50 mg were respectively 1.8 ng/ml (SD 1.10), 2.2 ng/ml (SD 1.87) and 2.6 ng/ml (SD 0.69). Low pre-treatment blood concentrations of FGF2 and IL8 predicted favorable response to therapy (p values 0.02 and 0.006, respectively), while high levels of TEK gene transcript predicted treatment resistance. Considering the antitumor activity and response duration, the negligible toxicity of the highest dose investigated and the lack of drug accumulation over time, we suggest that 50 mg given three times a week is the optimal dose for metronomic oral vinorelbine. Further investigation of metronomic oral vinorelbine (MOVIN) at this dose is warranted in combination with conventional chemotherapy regimens and targeted therapies. Systemic therapy of metastatic cancers has moderately progressed over the last decade. Conventional chemotherapy appears to have reached a plateau in efficacy for most major solid cancers [1, 2] and a number of promising targeted therapeutics have failed to meet their objectives [3, 4]. Metronomic chemotherapy (MC) has developed as a patient-friendly therapy on the concept to induce prolonged cancer control without significant side effects even in frail patients [5–9]. It involves chronic administration of low-dose chemotherapy at regular short intervals and mechanistically it stands between targeted anti-angiogenic therapy and conventional chemotherapy, complementing known shortcomings of both [10, 11]. Most approved antiangiogenic drugs are inhibitors of the VEGF/VEGFR pathway of endothelial cells and demonstrate short-living clinical activity possibly because of rebound emergence of alternative angiogenic “escape” pathways [12–16]. Conventional application of cytotoxic drugs at maximum tolerated doses (MTD) aims to induce highest possible apoptosis on cancer cells, but it also affects healthy proliferating tissues and requests treatment-free intervals to allow recovery from toxicities. However these treatment gaps may facilitate repair of damaged tumor vasculature rendering cancers aggressive and resistant [17, 18]. MC seems to have the capability to bridge weaknesses of both targeted antiangiogenic therapy and conventional chemotherapy because it induces a pathway-independent inhibition of function and proliferation of tumor endothelial cells and in addition it can damage cancer cells, restore immune response and induce tumor dormancy [11, 19–21]. In a previously published phase 1A study we defined pharmacokinetics and a dose range of metronomic oral vinorelbine that can safely be given to patients with advanced cancer and provided clinical evidence of the antiangiogenic basis of this therapy . We now report the results of a dose selection randomized trial registered at http://www.clinicaltrials.gov (Trial ID NCT00278070) that aimed to define the optimal metronomic dose of oral vinorelbine by considering clinical end points, pharmacokinetic data and correlative biomarkers. Defining the optimal dose of metronomic chemotherapy remains a challenge [23–26]. This was a multi-institutional randomized open-label phase IB trial conducted in 6 medical centers. Eligible patients were randomly assigned to receive oral vinorelbine tartrate (Navelbine® softgel capsules) at one of three predefined flat dose levels (30 or 40 or 50 mg) taken orally 3 times a week before lunch. Treatment continued until disease progression or occurrence of treatment related toxicity grade 3 or higher or patient’s decision or maximum 24 months treatment. The study was conducted in accordance with the Declaration of Helsinki and Scientific Committees of involved institutions approved the protocol. Eligibility criteria were similar to those of the phase IA part of the trial . Eligible patients had to sign an informed consent before participation. Eligibility criteria were as follows: age 16–75 years; performance status 0 to 2 according to the WHO scale; minimum life expectancy of 16 weeks; adequate bone marrow, hepatic and renal functions; absence of brain metastasis; metastatic and locally advanced hormonal refractory prostate, or previously treated metastatic breast cancer or non-small cell lung cancer previously treated with no more than two chemotherapeutic regimens; no other concurrent anticancer chemotherapy; serum creatinine within normal limits; hemoglobin of at least 10 g/L, white blood cell counts ≥3.5x109/L; absolute neutrophil count (ANC) ≥1.5x109/L; platelets ≥150x109/L; total serum bilirubin ≤1.5× upper normal limit (UNL); transaminases ≤ 2.0 × upper normal limit (UNL) unless attributed to liver metastases. Concurrent limited field radiation therapy (RT) and any previous RT was allowed. Exclusion criteria were the following: major active infection; more than two prior chemotherapy regimens for metastatic disease; chemotherapy administered within 28 days prior to start of metronomic vinorelbine; extensive liver metastases occupying more than half the liver; ongoing anti-coagulation therapy; pregnancy or breastfeeding and any of the following if occurred within 12 months prior to randomization: myocardial infarction, severe/unstable angina, coronary/peripheral artery bypass graft, congestive heart failure, cerebrovascular accident or transient ischemic attack, pulmonary embolism, cardiac dysrhythmias of grade >/= 2, atrial fibrillation of any grade or heart rate corrected QT interval (QTc) > 450 msec for males or > 470 msec for females, uncontrolled hypertension (> 150/100 mmHg despite optimal medical therapy). Patients with severe acute or chronic medical or psychiatric condition that in the judgment of the investigator would make the patient inappropriate for entry into the trial would also be excluded. Drop-off reasons included serious adverse events possibly related to the study drug, conditions requiring therapeutic intervention not permitted by the protocol and patients personal preference. The consort diagram of the study is shown in Figure 1. Consort diagram describing the main characteristics of the present clinical study. Patients attended outpatient clinics every two weeks during he first two months on treatment and monthly thereafter for clinical assessment and blood sampling. For pharmacokinetic analysis, 5 ml whole blood samples were collected into EDTA tubes (Sarstedt, Germany) before treatment initiation and at follow-up visits before taking oral vinorelbine. Samples were stored at −20°C until analysis. Additional blood plasma and blood RNA were obtained prior to treatment, 4 weeks later and on a monthly schedule in consented patients in order to study circulating angiogenesis biomarkers. Both plasma and PAXgene RNA™ tubes (Qiagen, Thessaloniki, Greece) were stored at −80°C until analysis. The primary clinical endpoint was time to treatment failure (TTF). TTF rates per treatment arm would be compared at 4 and 6 months. Secondary endpoints were progression-free survival (PFS), time-to-progression, toxicity, correlation of baseline blood concentrations of angiogenesis-associated surrogate markers with treatment efficacy measures, and pharmacokinetics. Toxicity was evaluated according to the National Cancer Institute Common Toxicity Criteria V3. Acute toxicity was considered any adverse event that occurred during the first 8 weeks of treatment, while chronic toxicity was characterized any side effect that was recorded four months after the initiation of treatment. Toxicity that occurred between 8 weeks to 4 months of treatment was characterized sub-acute. Treatment response was evaluated in patients that had completed at least 6 weeks of treatment and had at least one follow-up tumor assessment. Baseline tumor assessment was performed within 4 weeks prior to treatment initiation and thereafter every 2 months until documentation of response. Documented response should be confirmed after 4 weeks and should be regularly assessed every 4 months thereafter. Chest X-rays, computerized tomographic (CT) scans, ultrasound imaging studies and clinical measurements were used as appropriate. Response was documented using the RECIST response criteria for solid tumors  and Bubley Criteria for prostate cancer . 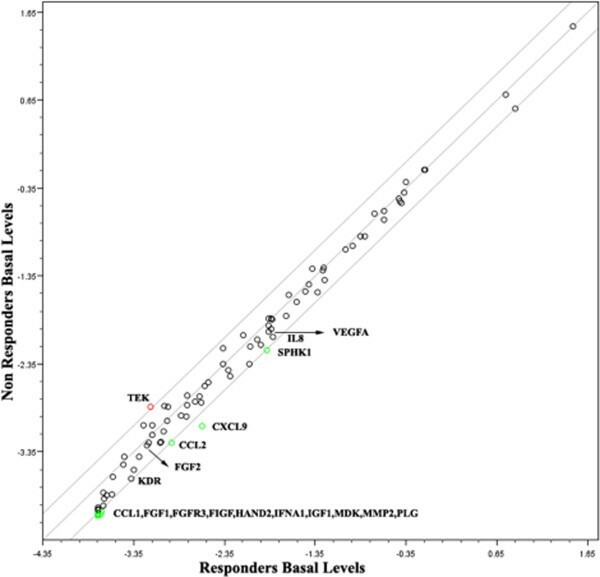 Plasma concentrations of basic fibroblast growth factor (FGF2), vascular endothelial growth factor-A (VEGFA), interleukin-8 (IL8) and thrombospondin-1 (TSP1) were determined by using commercially available quantitative sandwich enzyme immunoassays. In particular, Quantikine kits (R&D Systems, Inc., Minneapolis, USA) were used for FGF2, VEGF, VEGFR2 and IL8, and the ChemiKine Human TSP1 EIA Kit for TSP1 (Chemicon International, Inc., Temecula, CA, USA). Protocols, procedures, and equipment were used according to the manufacturer’s instructions. The lower detection limits for FGF2, VEGF, VEGFR2, IL8 and TSP1 were respectively 10, 31.2, 78.1, 31.2 and 9.8 pg/mL and the means for intra- and inter-assay coefficients of variation were 3.6 to 7.8 and 6.5 to 10.0, respectively. Optical densities were determined using a microfilter plate reader (DAS-A3, Roma, Italy) with filters for 450 nm (IL8, VEGF, VEGFR-2) and 490 nm (FGF2, TSP1). All analyses were carried out in duplicate. Samples available for each biomarker are shown in the REMARK diagram of Figure 2. REMARK diagram for biomarker studies. Peripheral blood was drawn in PAXgene tubes and kept frozen at −80°C. Total RNA was extracted with the PAXgene blood RNA kit, according to the manufacturer’s instructions (PreAnalytiX/Qiagen), within 6 months from collection. The additive contained in the PAXgene tubes reduces in vitro RNA degradation and minimizes in vitro gene induction . RNA was extracted from 4 patients who either had an objective response (three patients) or TTF >6 months (1 patient) and 4 patients who relapsed early (within 2 months of the initiation of treatment). The analysis was done in mirrored samples: before treatment initiation and 4 weeks after treatment initiation. RNA integrity was checked by both conventional RNA electrophoresis and Agilent bioanalizer 2100. High quality RNA was reverse transcribed and analyzed on a PCR array platform (PAHS-024 F, SABiosciences) and the expression levels of 84 genes involved in angiogenesis were determined by using real time PCR. Only RNAs with RNA integrity number (RIN) >7 were used for reverse transcription and further processing. For reverse transcription the SABiosciences RT2 First Strand kit was used. In all cases RNA of 0.5 μg was reversed transcribed. Simultaneous quantification of 84 key genes involved in angiogenesis was done by using the angiogenesis RT2 profiler PCR Array (PAHS-024 F, SABiosciences). Relative expression was determined with the Light Cycler 480 instrument (Roche) and the ΔΔCt method . Whole blood samples were shipped on dry ice to the Institute de Recherché Pierre Fabre, Castres, France, for analysis. Concentrations of vinorelbine (VRL) and its main metabolite, 4-O-deacetylvinorelbine (DVRL) were quantified using a sensitive LC/MS/MS method previously reported . Analysis was performed on an intent-to-treat basis. Regarding the definition of endpoints reported, time to treatment failure (TTF) was calculated as the time from random assignment to disease progression or death from any cause or early treatment discontinuation. Time to progression (TTP) was calculated as the time from random assignment to disease progression. Progression-free survival (PFS) was calculated as the time from random assignment to disease progression or death from any cause. Survival was calculated as the time from random assignment to death from any cause. Event-free patients at last contact were censored. Time-to-event distributions were estimated using Kaplan-Meier curves while the log-rank test was used for comparisons. The Fisher’s exact test and the Jonckheere-Terpstra exact test were used to examine differences in toxicity rates between treatment groups. Association between biomarkers at baseline and response/activity (patients without objective response and/or progressing within 4 months vs those with objective response or PFS > 4 months vs healthy controls) was assessed with the Kruskall-Wallis test. Correlations among biomarkers were calculated using the Pearson’s correlation test. Significance was determined at the level of 5% (two-sided). The sample size for this 3-arm randomized study was estimated under the assumption that the expected 4 and 6 month TTF rate for the 30 mg, 40 mg and 50 mg groups would be 10%, 30% and 50% and 5%, 20% and 40% respectively. Using a global chi-square test at the 2.5% level of significance (Bonferroni adjusted) the study had 80% power to reject the null hypothesis that all the arms had the same TTF rate . Between January 2006 and January 2007, 73 eligible patients were recruited into the trial. The median age of the patients was 67 years for the 30 and 50 mg dose levels and 66 years for the 40 mg dose level arm. The majority of patients (68.5%) were male, they had a PS 1–2 (64.4%) and the most common cancer was NSCLC (42.5%), while 80.8% had received prior chemotherapy and the most common metastatic site were bones (57.5%). Baseline patients’ characteristics are shown in Table 1. Antitumor efficacy was seen at all dose arms. Confirmed partial remissions were documented in four cases of patients. 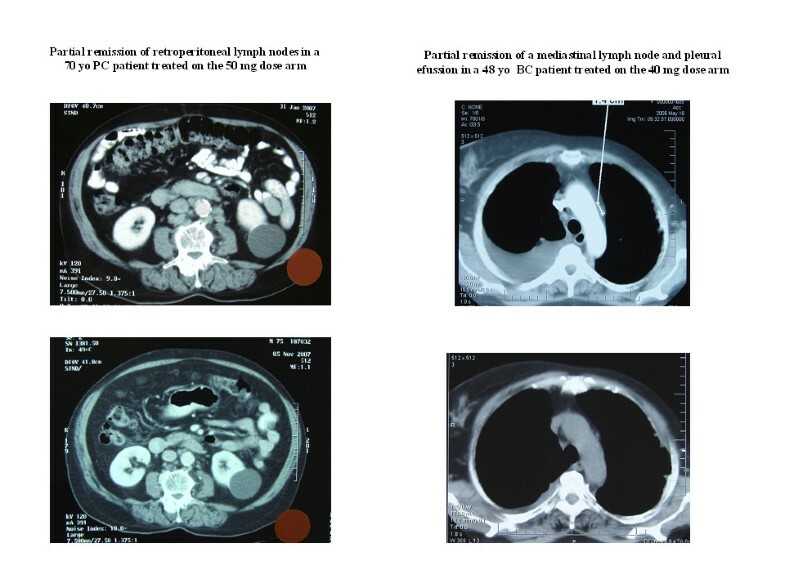 Those were two NSCLC patients who received 30 mg (response duration 4 weeks) and 50 mg (response duration 100 weeks) one breast cancer patient treated at 40 mg (response duration 18 weeks) and one prostate cancer patient treated at 50 mg (response duration 30 weeks) (Figure 3). Eleven patients achieved a TTF longer than 6 months. 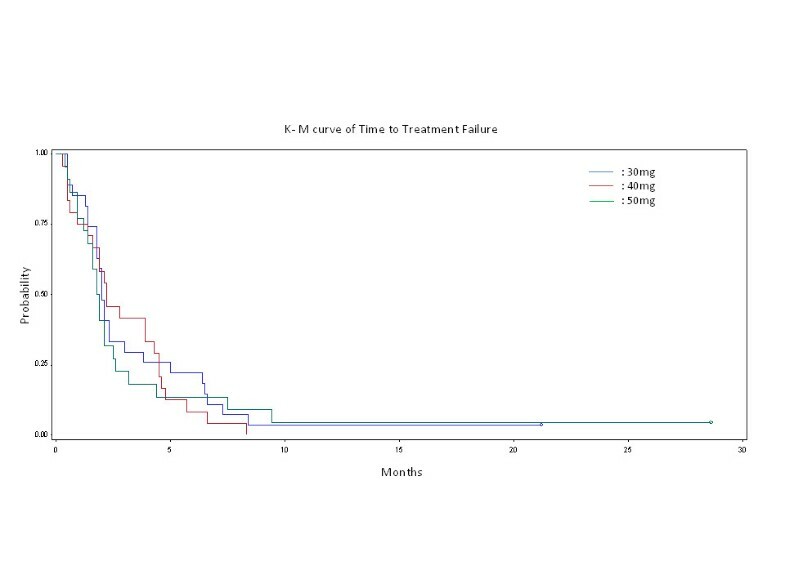 No arm was found superior at the primary endpoint (Table 2, Figure 4). The median time to treatment failure was eight weeks in all three arms, while the 4 month TTF rate point estimates and 95% Confidence Intervals (CIs) for the 30 mg, 40 mg and 50 mg vinorelbine groups were 25.9% (11.1%-46.2%), 33.3% (15.6%-55.3%) and 18.2% (5.2%-40.3%) respectively. The p-value of the Fisher’s exact test for equality of the rates is 0.56. Similarly, the 6 month TTF rate point estimates and 95% CIs were respectively 22.2% (8.6%-57.7%), 8.3% (1.0%-27.0%) and 13.6% (2.91%-34.9%) for the 30 mg, 40 mg and 50 mg groups respectively. The p-value of the Fisher’s exact test is 0.39. In both cases the TTF rate did not vary statistically significant among the treatment arms. No differences were noticed among the three arms with regard to PFS and overall survival. Objective tumor responses. Objective responses documented in a prostate cancer patient treated at 50 mg dose and a breast cancer patient treated at 40 mg dose. Time to treatment failure probability curve. The side effects observed were generally mild and negligible. No differences in grade 3 and 4 acute toxicities were seen among the three dose levels. The only statistically significant difference observed was lymphopenia (worse in lower dose levels) and gastrointestinal (worse at dose level 40) (Table 3). Chronic toxicities did not occur. Trough levels of vinorelbine were measured in 237 blood samples drawn from 44 consented patients (61% of treated patients) over a time that spanned duration of therapy from 2 to 36 weeks. Steady state concentrations were similar to those recorded in the phase IA trial with no evidence of accumulation over time (Figure 5). Mean values and standard deviation (SD) for the 30 mg dose was 1.8 ng/ml (SD 1.10), 2.2 ng/ml (SD 1.87) for the 40 mg dose and 2.6 ng/ml (SD 0.69) for the 50 mg dose. A dose proportional increase of steady state concentrations was noted but did not reach statistical significance (ANOVA p value = 0.5). Trough blood concentrations of vinorelbine over time. Scatter plots of serial trough concentrations of VLR and its active metabolite DVLR over time in a patient prostate cancer patient treated at 50 mg dose arm (A) and a breast cancer patient treated at 40 mg (B) and median (plus SEM) values of steady state levels of all patients treated at the three dose arms (C). 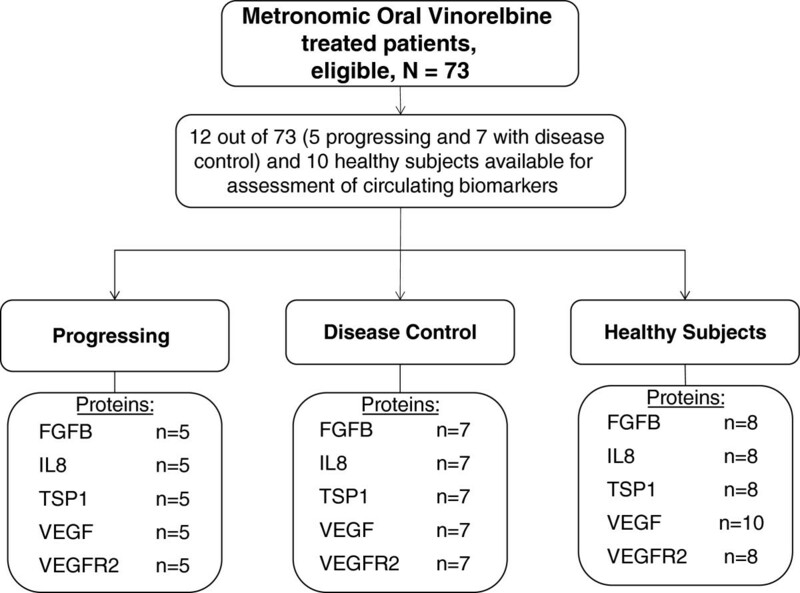 Of the investigated angiogenesis modulating proteins, baseline pre-treatment levels of FGF2 and IL8 were found to have a power to predict favorable response to metronomic vinorelbine (p value = 0.02 and 0.006 respectively). In particular, patients with baseline levels approximating those of healthy individuals had a chance to have a favorable outcome to therapy. 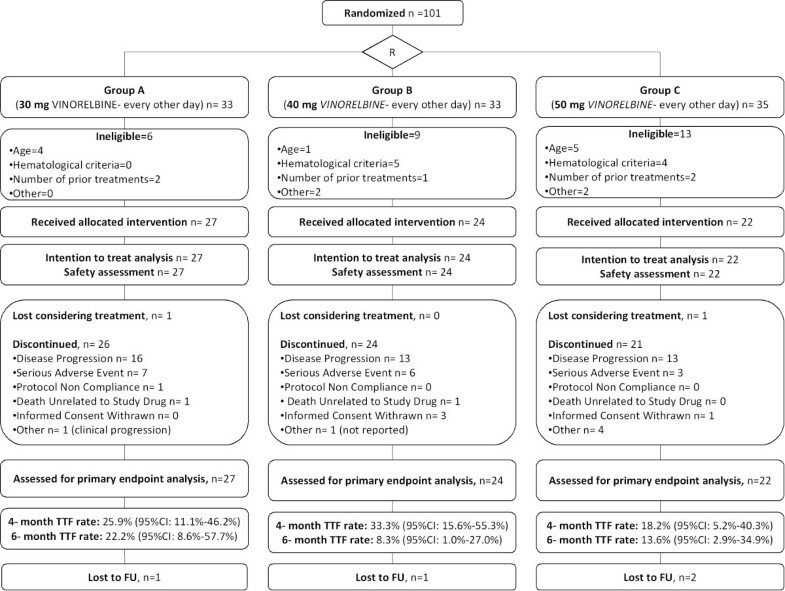 VEGF and VEGFR2 baseline levels did not differ between patients with favorable versus non-favorable therapy outcome and TSP-1 data were inconclusive at a marginal p-value (Table 4). Data analysis of circulating gene transcripts by using the ΔΔCt method revealed that TEK gene transcript was significantly up-regulated before treatment in non responders, while gene transcripts of SPHK1, CCL2, KDR, CCL1, FGF1, FGFR3, FIGF, HAND2, IFNA1, IGF1, MDK, MMP2, PLG were down-regulated about two fold and the CXCL9 gene was down-regulated 2.92 fold. FGF2 transcript post treatment initiation was found to be up-regulated in non responders and IL8, PGF, FIGF, IGF1 gene transcripts were down-regulated more than 2 folds (Figure 6). Transcript levels of 84 angiogenesis-related genes graphed against treatment outcome Scatter plots comparing circulating pretreatment gene transcript levels of responders versus non-responders. The graphs plot the log10 of normalized gene expression levels between the two conditions, responders (x-axis) and non-responders (y-axis). Dots outside the area between the two lines indicate fold differences larger than a threshold of 2. The red dots in the upper left corner readily identify up-regulated genes, and the green dots in the lower right corner readily identify down regulated genes. This was a dose selection study of metronomic oral vinorelbine for the treatment of metastatic NSCLC, breast and prostate cancer patients that had relapsed from a previous therapy. The primary clinical endpoint of this trial was set to be time to treatment failure (TTF). We chose TTF as a primary endpoint because it is a composite measure that co-estimates time from randomization to discontinuation of treatment for any reason, including disease progression, treatment toxicity, and death. It trade-offs efficacy and toxicity, which is of major importance for metronomic therapy, especially when tested in patients with diverse tumor types . This trial failed to demonstrate superiority in any of the three doses investigated at the primary endpoint, since median TTF was six weeks for all three arms and the TTF rates at 4 and 6 months did not differ among the three arms either. Considering the objective tumor responses, partial remission was confirmed in four cases and lasted up to 49 weeks. Two of the objective responses occurred in patients treated at the upper dose arm and lasted longer compared to objective responses that were achieved with the lower doses. Major finding of this trial, as in the previous one, was that activity came at no cost of clinically significant toxicity, which is a hallmark of metronomic chemotherapy . In addition, toxicities that are known to occur with drugs that inhibit the VEGF – VEGFR-2 pathway were not seen with metronomic vinorelbine, which supports that a combination of these two antiangiogenic therapies would be probably feasible [35, 36]. Antiangiogenic therapy is known to work optimally if endothelial cells are exposed to steady levels of inhibitors [11, 37]. Both vinorelbine and its active metabolite achieved steady state concentrations at the low nanomolar range, which was found in vitro to optimally inhibit proliferation of endothelial cell and induce expression of endogenous anti-angiogenic molecules . Similarly to the phase IA study, we found that low baseline levels of circulating endogenous promoters of angiogenesis and in particular IL8 and FGF2 could predict clinical benefit from treatment with metronomic vinorelbine . In addition, we investigated circulating transcripts of a panel of 84 key genes involved in modulating the biological processes of angiogenesis. Among them, high baseline levels of TEK transcripts were associated with resistance to therapy. TEK, a biomareker of hemangioblasts, appears to be a potential predictor of refractoriness to antiangiogenic therapy [39, 40]. This is possibly related to its function as an endothelial cell surface receptor for angiopoietins ANGPT1, ANGPT2 and ANGPT4, that are regulators of survival and adhesion of endothelial cells and promoters of vascular stability and quiescence . Overall, this study failed to specify the optimal metronomic dosage of oral vinorelbine by the primary endpoint. However it boosts the findings of the phase IA dose-ranging study by confirming that metronomic oral vinorelbine can safely be administered at doses up to 50 mg three time a week and that it can yield long lasting antitumor activity at the this dose without overt toxicity. In addition the steady-state nanomolar concentrations and the association of angiogenesis modulating factors with its activity denotes that the mechanism of antitumor activity of metronomic therapy is most likely antiangiogenic, as suggested by other investigators too [26, 42]. 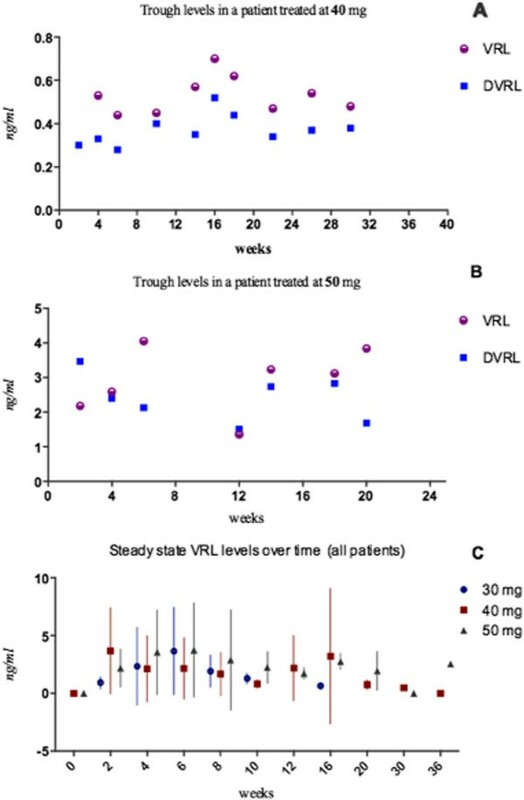 In conclusion, by taking into consideration the antitumor activity and response duration, negligible toxicity of the higher dose tested and lack of drug accumulation over time, we suggest that metronomic oral vinorelbine warrants further investigation in combination with conventional chemotherapy regimens or targeted angiogenic therapies at the dose of 50 mg given every other day, three times a week. Finally these data add support to the concept that metronomic scheduling provides a new future for using cytotoxic chemotherapy, especially in cases of incurable metastatic cancers . We thank Olga Siarabi (Data Manager) and Maria Moschoni (Study Secretary and editorial assistance) for their contributions in this study, and Dr Eleftheria Hatzimichael for critical reading and language editing of the manuscript. Presented at the 33rd ESMO Congress, 12–16 September 2008, Stockholm Sweden, Abstract ID 643. Evangelos Briasoulis received a research fund from Pierre Fabre, Farmaka SA, Greece, through the Research Committee of the University of Ioannina, for the biomarkers subproject of the study. Other authors declare no conflicts of interest. Conception: EB. Study Design: EB, GK, PP. Patient enrollment, clinical management, data recording and collection of biologic material: EB, GA, TM, IV, IX, AV, GK, IB, GF, KNS, HK, ES. Molecular analysis and interpretation: IS. Pharmacokinetics and biomarkers analysis and interpretation: PP, EB. Statistical design and analysis: GK. All authors read and approved the final manuscript.